Independence Day is a memorable day in the history of Bangladesh. 26th March is observed as Independence Day. The Pakistani rulers were very cruel and barbarous to us. They started an inhumane attack on the innocent and peace loving people of this country on 25 March 1971. Thousands of people were killed. Many women were raped. Hundreds of intellectuals are also killed. In the late hours of 25th March 1971, when the Pakistani forces unleashed “Operation Searchlight”, Bangabandhu Sheikh Mujibur Rahman, the father of our nation declared the independence of Bangladesh. The day’s programme begins with the dawn of the day. The national flag is flown on all government and private buildings in towns. Dhaka, our capital city, takes a festive look on this day. Various units of our armed forces exhibit parades before the spectators. Special prayers are offered for the martyrs who died in the Bangladesh Liberation War in all mosques, temples and churches of the country. Shaheed families are paid honor and respect. Various social and cultural organizations hold functions to celebrate the day. The President and Prime Minister of Bangladesh, different political parties and socioeconomic organizations undertake programs to mark the day in a befitting manner, including paying respects at Jatiyo Smriti Soudho, the national memorial, at Savar near Dhaka. 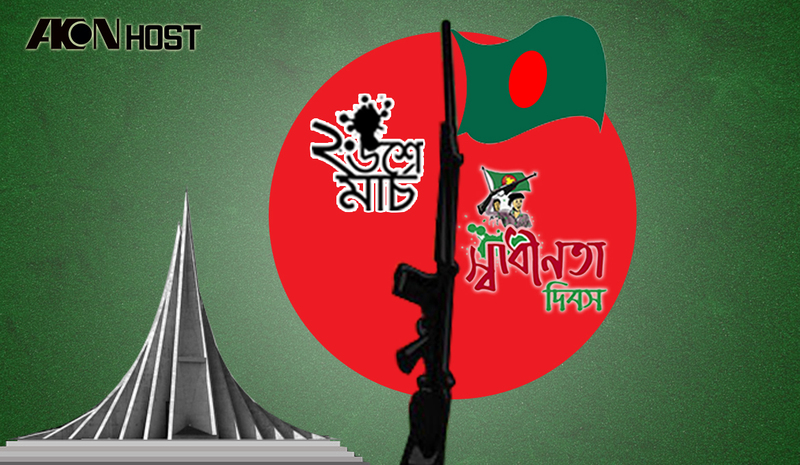 AkonHost respects for those martyrs who died in the Bangladesh Liberation War. We pledge our love and toil to our beloved motherland. একন হোষ্ট বৈশাখী অফার!!!! ১ গিগাবাইট হোষ্টিং কিনলেই সাথে পাচ্ছেন একটি ডোমেইন ফ্রী!